Masters in English Literature is one of the popular degree and career options. Available to students who have completed their undergraduate studies. This course is suitable for graduates from variety of disciplines. Making it one of the highly competitive post graduate entrance exams in India. Another major reason for popularity of M.A. English course is that it helps students to develop their critical abilities. Especially in reading, writing, thinking and researching. Making them suitable for top reputed jobs. Such as in fields of teaching, publishing, journalism, creative writing etc. So, if you are planning to take up English literature in your postgraduate studies. Then it is important to create interest in it, and develop your critical thinking. Apart from these, you will also need proper guidance to prepare for MA English entrance exam. Also, good knowledge about MA English entrance test syllabus of top Universities. As there are slight to major variations in it. Learning Skills gets you everything together in its MA English entrance exam coaching. We have been producing top ranking students in MA English entrance exams since 2014. It is our unique approach to teaching, meticulous guidance, and targeted learning. That enabled students to grab seats in MA English at top Universities in India. 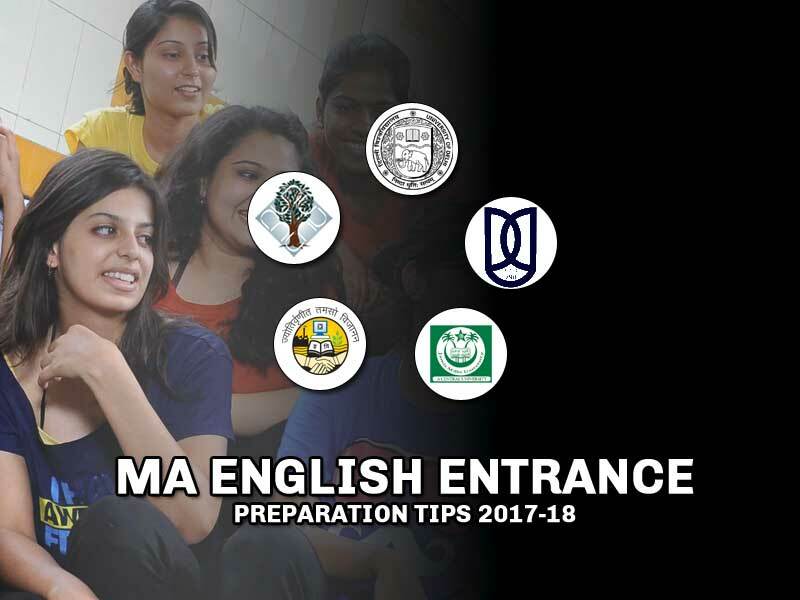 I have come up with tips and tricks to help students crack MA English entrance tests. Just follow these tips and tricks. You will be better equipped and placed to crack MA English entrance exams 2017 in India. From the outset, you should focus on History of English. Starting from Ancient period to Contemporary period. It is crucial to your MA English entrance preparation. However, the entire entrance examination is not based on history of English Literature. There are other major and unique topics that students need to prepare for exam. You should have basic knowledge of socio-political and economic background of all ages. That you are going to cover. Highlighting all the important literary events and movements associated with the particular ages. This will give you contextual knowledge of the major works in history of English. During MA English Entrance preparation, you should also gather all the authentic facts. That will help you in dealing with factual questions. For example, while Studying the Renaissance period. Make a list of all important biblical translations from Medieval to Renaissance period. And Theater history from Renaissance period to Restoration period etc. History of English Literature has detailed coverage of British literature. With some references to other literature. But nowadays top universities are giving equal weightage to other literature alongside British’s. Thus, include broad range of categories of other literature in your MA English entrance preparations. Such as American, Indian English, Caribbean, Australian, African literature etc. The complete Coverage of Entire English literature is very difficult and exhaustive work. Its proper detailed study may take several years. Therefore, Students should divide the MA English Entrance examination syllabus into several categories. All categories should be studied according to their relevance to exam pattern. The first category to cover is ancient and medieval English literature and theory. There is certain influence of these writings upon later ages. and movie adaptations of Shakespeare’s plays. From Jacobean period onward, the syllabus starts getting vaster and very detailed. That’s why you should choose special texts, topics and authors to study from the range of categories. Belonging to 18th century and Romantic studies, Victorian, Modern and Contemporary studies. While preparing for MA English Entrance exam, you should have proper idea of Literary Theory and Criticism. As most of the questions are asked from this area. It is highly crucial to your preparation strategy to ensure detailed study of it. The last year changed DU MA English entrance exam reflects just that. It is again relevant for JNU, Jamia, Ambedkar and other top universities’ MA English entrance test. Students should develop their critical skills to study the theory and criticism section. As one can’t attempt questions related to this section without proper understanding. According to the recent pattern of DU MA English Entrance Examination. There were number of critical passages. That were related to recent critical theories and statement based questions. In some of the entrance exams, there were questions on critical appreciation of a poem. You cannot handle these questions without developing critical thinking, reading and writing skills. Pattern change from minute to major took place last year across major MA English entrance exams in India. Notably in DU’s MA English entrance test last year. There were several questions in logical reasoning, visual arts, current affairs and others. However, all questions were in context of English literature. You can handle these questions by reading literature in relation to art forms. Go through all important rhetorical devices, poetic forms, literary terms and narrative techniques. During your MA English Entrance preparation, you should check your progress at regular intervals. As they say practice makes the man perfect. So, try to sit for mock and practice test several times. Then get your performance assessed. This will help you gain essential experience in handling questions and stress. Major entrance exams not only judge the hard work. But the devotion and emotional quotient of students. Moreover, it judges student’s critical abilities and skills on decision making. That too, within fixed time frame makes it harder for you all. But again, it is by design. So, my last advice to you is to work on your time management skills. I hope you find these tips useful and relevant. If you have any questions related to MA English Entrance exams. Then, please feel free to use comment box below. I would be happy to help and answer your queries and questions. Specific topics from it for entrance. Structuralism, Post-Structuralism, Deconstruction, Feminism, Post Colonial Studies, Diaspora Writers, Cultural Studies, and African-American Literary Theory Writers are the major topics from which you often get questions in MA English Entrance. Hey!How can I develop my critical and analytical approach towards literature? My command in history of English literature is sound. But what I gathered from Ambedkar ‘s previous years’ question papers is that it’s not going to help at all. How can I develop that critical approach? How should I prepare to face critical appreciation of unknown poems type of questions? Please help. The unseen poems or passages you get in exams should be handled as RTC (Reference to Context). That means, it doesn’t matter if you do not have idea of the background and author. All you’ve to do is to write a critical description on it as you understand by reading it. However, to write a critical description you should have sound idea of literary devices, theories, critical approaches, and history of English. – A critical description starts from narrow and then moves to broader topics. – Strong and relevant reasoning behind your opinion is a must. – Correlation and connections with historical background and literary theories and devices enhances quality of answer. – Follow KISS – keep it simple silly, instead of using difficult words only to beautify your answer is a strict no. “Generally, Feminism can be considered as the advocacy of women’s rights. But, in literature feminism emerged as one of the prominent movement depicting the power struggle, demand for subversion of hierarchical position, and the freedom of self from the boundaries set by patriarchal society. There are many famous female writers who are later categorized/labelled as ‘prominent feminist writers’. For example, Aphra Behn, as she was one of the first professional female writers to ‘earn her livelihood by pen’. Then there are number of writers from Jane Austen to Charlotte Bronte, giving a whole spectrum of female struggle in a male dominated world through the narration of their female protagonists’ lives. In modernism period, Virginia Woolf is known for complete projection of her heroines’ thoughts and their urge to overcome the social pattern provided by male society, through the use of ‘stream of consciousness’. Isn’t there grammar in ma English entrance exam?? There are only a few questions on Grammar, around 3-4 not more than that. Largely questions come from history of English only. What are the maximum marks of DU’s entrance examination paper? Could u please suggest me books for the main topics?? The information is quite helpful but does that mean I don’t need coachings for this because I already did my undergraduation In literature but I didnt understand the pattern of all the universities well. And how to solve the statement based questions as well. It depends person to person, whether they need it or not. But coaching is simply teaching – where a qualified teacher works hard and ensure that all his/her students understand the concepts and imbibe the information. Our teachers are experienced in it, therefore, recently we had amazing results from DU, Ambedkar and IP University. We have top rankers from these universities. However, we will soon be updating our results online. And yes, you may need guidance and training in attempting statement based questions, and also you will need to cover History of English (which is not covered at UG level). Apart from this, if you’re attempting to get a seat in JNU or Ambedkar then you will need writing skills as well. Hence, for a student who do not have proper guidance and support, who’s unsure of his/her preparations, and wants an expert to help him/her, then in that case that student should always seek coaching. how should i practice on literary theory and criticism? I don’t have any idea about it. Not possible. We have gone through major guides including top Publishers’ as well. But almost all fail on the writing part and again we found a lot of errors. Please provide previous year question papers of Du jnu and ambedkar University in pdf. They are available here but not in pdf. Thanks a lot for your guidance. Also guide if you provide online classes for M. A ENTRANCE EXAMS. how much time do the above process of preparation (ideally) take? We recommend at least a year while pursuing your 3rd year. However, if you’re free from your graduation studies then you could complete your preparations within 4-6 months time period. can u plz tell me a summary topics that can cover up all the syllabus for entrance..
Would it be descriptive type or optional type? DU MA English Entrance exam is complete objective, meanwhile JNU MA English Entrance exam is subjective. Hi. I don’t have a BA in Literature but would like to pursue an MA from DU. How exactly can I start preparing for it? Which book is good for prepration of ma english entrance exam? Thanks a lot. For ur tips. Can u please give me a question and mark me on my answer to it so that i come to know where do I stand.It might be tedious you but it’s really a very sincere and humble request. Hi,do you educate/take classes online? i had completed my b.tech with 67% aggreagate, but i want to pursue MA ENGLISH, i know it is totally different but i am interested very much. please guide me how to prepare for MA ENGLISH enterance test? Hi, I am planning to give the entrance exam this year, in 2018. Could you please help me with the detailed syllabus and what study materials should i be referring. Thanks! How should a bsc science graduate start preparing for MA English College entrance test? And how much time will he need to start from scratch.? Start from the targeted syllabus given for MA English Entrance exam. The timeline depends largely upon your absorption speed and dedication, it can be 3 to 6 months. i need to know what i’m genuinely required to study from literary theory and criticism? I am not from literature background. I know it will be difficult for me to crack the entrance. How do I go about at the first place? You could purchase books on History of English and Literary Criticism here https://learningskillsindia.com/store/shop/ as the majority of the questions will come from it. I have an exam in 20 for ma English du, so sir I just want previous year paper because. The syllabus is really vast important topic. And if am not fully prepared with literally theory and criticism. Because I never had in my graduation and rest syllabus. Still it is ok.? Sir, what is the question pattern of MA English entrance of JNU ??? How can I improve my writing skills in writing critical essays? Will my reading habit help me in writing incisive critical essays? Which are the books that your institute prefers? Sir I wish to do ma English in jnu but yet I didn’t start my preparation for that.now I heard jnu is going to held the exam after 2 months that is December.I think I can’t brake that exam because I haven’t much time for it,and my knowledge is poor in English literature I haven’t much time for preparation I Know that 2 months is not sufficient for the preparation so what should I do .I hope your help. Will u give me better instructions. I will give my entrance for MA English 2019, so I want to know specific area which should be laid focus on and important topic from literary theory and criticism and do we need to have knowledge of literary terms? There are no shortcuts or any specific topic which may, of course, make a difference. You need to cover History of English, and Literary Theory and Criticism (literary terms part of it) in detail, in order to prepare effectively for MA English Entrance exam. Hey! I am a computer application graduate but I want to opt English for my masters. I have no clue about the BA English syllabus whatsoever. I want to get into one of the best universities as well. Can you tell me where to start from, the books I must read and how should I prepare? As you will need to start from the basics, therefore, we recommend taking up our MA English Entrance coaching, we have both online and offline batch. Can a b.com graduate write this entrance for pg in English literature. ?